My daughter, J, celebrated her 7th birthday on a moderate scale recently. My wife and I vaguely suggested to our son to make a birthday card for his sister – thinking it could be an impossible dream. But to our surprise, K took up the challenge right off the bat. Despite my encouragement to draw on his own, K refused. He insisted that I should help. With a little assistance from me, he managed to draw something. I must say this: On the coloring part, he had done a very good job. 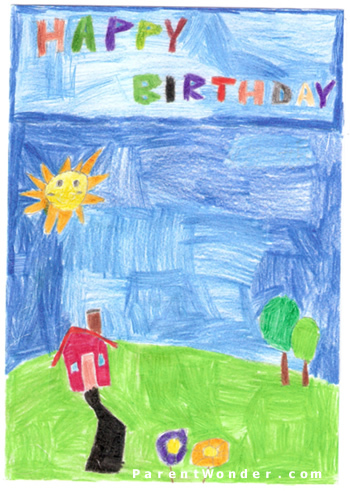 He spent one afternoon (and later evening) to completely color his first home-made birthday card – all by himself. On normal days, he would have drawn me to help out after he tires himself. But this time, I could see that he had put a lot of effort and concentration into completing this card – though he finished it in two sessions. Upon completion, he was extremely proud of his work… and himself. Making the card is all well worth the effort and J loves the card very much. Here it is, K’s first hand-made birthday card for his sister. Not bad for a 4-year-old boy!